The Maps on the right shows the year round movements of all our marked individuals between 2010-2013. The warmer colours (yellow) show the summer ranges and red show the winter ranges. 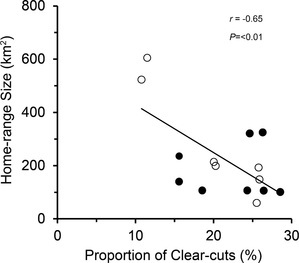 Home range size declines with higher proportion of clear cuts. 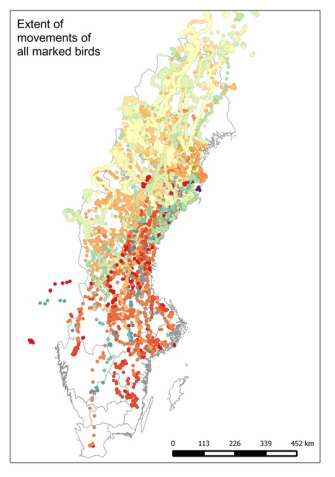 Figure left: Relationship between home-range size (95% MCPs) and proportion of clear-cuts within the home ranges for Golden Eagles (n = 15) during the 2012 breeding season in northern Sweden with the correlation coefficient shown for the pooled number of males and females. Open circles denote females whereas closed circles denote males. from Moss et al. (2014) J. Rap. Research.